The state of California can be viewed as the epicenter of aesthetic medicine. The industry is already huge there, and many more doctors—core and non-core alike—are moving into the market and opening medical aesthetic practices in the state. Due to the size of the medical aesthetic market in the state, California’s Board of Barbering and Cosmetology tends to set a standard for other regulatory agencies around the country, so even if your medical spa isn’t located in the Golden State, it’s worth paying attention to what happens there to learn what might be forthcoming in your neck of the woods. In California, there are very specific regulations that govern who can perform which treatments at a medical esthetic practice. These rules are very strict—much stricter than many medical spa owners and operators understand, and much stricter than in most other states. For example, the Medical Board of California and the California Board of Registered Nursing have ruled quite clearly that anybody with less certification than a registered nurse should not be firing lasers. So essentially, the operation of aesthetic lasers in the state of California must be limited to registered nurses, nurse practitioners, physician assistants, and doctors. We have seen that in California, many laser centers allow lasers to be fired by people who do not fit into these categories—typically laser technicians. Unfortunately for these facilities, the Medical Board of California, the California Board of Barbering and Cosmetology, and the California Board of Registered Nursing are making a conscious effort to crack down on practices such as these. The doctors who own and operate practices where estheticians and laser technicians are permitted to fire lasers can be punished severely. The situation in California concerning injectables is somewhat similar. 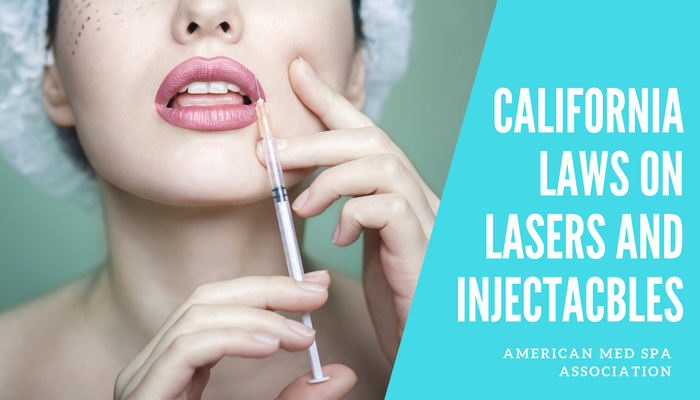 In the Golden State, nurses and other licensed medical professionals can inject Botox and fillers and conduct microneedling and dermaplaning treatments, but under no circumstances should anyone else be doing it. This is another area that is being focused on by the Medical Board of California, the California Board of Barbering and Cosmetology, and the California Board of Registered Nursing. Underwood also spoke about the issue of needle depth. It is worth noting that thus far, microblading—a treatment in which fine incisions and ink are used to create a semi-permanent makeup-like definition, typically for eyebrows—has thus far escaped scrutiny from these regulatory agencies. This is because the state considers that this particular treatment is governed by tattoo licenses. Therefore, if your medical aesthetic practice is offering this service, you should make sure that the people who are performing it have tattoo licenses, which in California typically are issued by counties. Otherwise, your practice is open to regulatory intervention. We will be discussing these and many other legal topics of interest to California medical spas at our San Jose Medical Spa and Medical Aesthetics Boot Camp, which will take place on Sept. 18 and 19. We have reached out to both the California Board of Barbering and Cosmetology and the Medical Board of California, and we hope members of both will pop in to answer any legal and regulatory issues attendees may have. Click here for more information and to register for the Boot Camp. We hope to see you there!